The beans are equally as simple: sauteed onions and an entire field of garlic (ok, 4 cloves), some fresh tomato, cilantro. Done! And the Kale Slaw is my favorite hippy vegan recipe, and really not much more difficult than making guacamole. It’s sliced into shreds, and doused in a creamy garlicky dressing of avocado, tahini, and red wine vinegar. So easy! Even though there are a few components, the entire recipe should only take 30 minutes or so. Now that I’m home and relaxed, I hope to be updating a little bit more regularly. Thanks for sticking around, everyone, and I hope you’re having a delicious (if restless) winter! ~You don’t have to press the tofu here, but if you have time, then it’s not a bad idea. Otherwise, just squeeze as much water out as you can, and blot the tofu with paper towels. ~I used my favorite S&B curry powder. Use whichever mild curry you like best! ~I was feeling very hippy vegan, and so I pulled out the old school Bragg’s Liquid Aminos for the tofu. You can use soy sauce or gluten-free tamari, too. If it needs more salt, just sprinkle some on after the tofu is cooked. ~To prepare the kale, pull the leaves from the stems. Roll up a few leaves at a time (into a cigar shape) and slice widthwise to make 1/4 inch strips. That is what “chiffonade” means! I used purple kale because PURPLE! But you can use whatever kind is available. About 1/2 of my bunch equaled the 6 cups needed for this recipe. Preheat grill over medium high heat, or preheat broiler. Slice tofu into 8 equal slabs, widthwise. On a rimmed dinner plate, use a fork to mix together Bragg’s, olive oil and curry powder. To grill, spray the hot grill pan with cooking spray. Dredge each slab of tofu into the curry mixture on both sides, then place on the grill. Let cook for about 7 minutes each side, or until grill marks appear. For broiling, place on a lightly greased baking sheet about 3 inches from the broiler. Broil each side about 5 minutes, keeping a close eye so that they don’t burn. When ready to serve, slice the tofu slabs into four strips lengthwise. Preheat a large pan over medium-high heat. Saute onion in oil with a pinch of salt, until lightly browned, about 5 minutes. Add the garlic and saute 30 seconds more. Add the chopped tomato, red pepper flakes and salt. Cook until tomato is broken down and releasing juice, about 3 minutes. Add the beans and heat through. Mix in the cilantro, and turn the heat off. Keep covered until ready to serve. Use your hands to massage the dressing into the kale for about 30 seconds. Taste for salt and seasoning. Warm the tortillas (I wrap mine in paper towels and microwave for 30 seconds.) 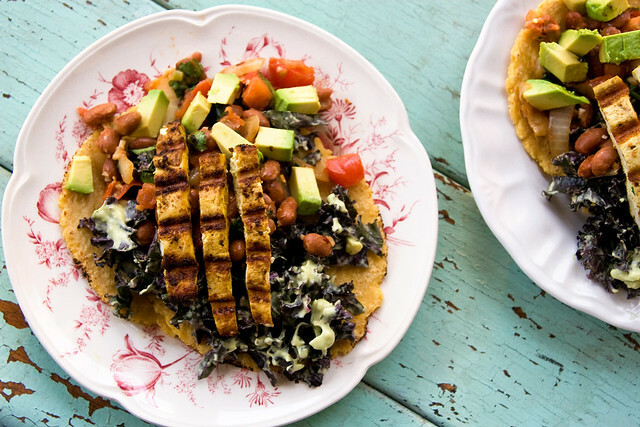 Place a bit of kale, a scoop of beans and a few strips of tofu in each taco. Add a little chopped avocado, and eat up! Is it 1 15oz can of beans? I updated the recipe, thanks. Welcome back isa hunny…..we have missed u! I have some lentil dal and onion bhajees in fridge so may do this tmoz too. My kids will hate it as they hate most spices so they can hav beans on toast ha ha. This looks amazeballs. would it work with spinach instead? This looks like an amazing meal. I love eating avocado with anything curried, it’s such a nice complement. I love the sound of the kale slaw. Tahini and avocado all in one dressing is right up my alley! Is the dressing supposed to have nutritional yeast in it, as mentioned in the intro? I’ll be making this while the snow is falling on Saturday! What could I use instead of avocado (allergic!) in the dressing? This was great, and ridiculously hippie, even without using the Bragg’s! When i first decided to experiment with becoming veganish, a friend gave me Appetite for Reduction. It was the only vegan cookbook i had for a while and I loved everything I made from it. Very shortly thereafter i stumbled on this website and began cooking from the archives. It was my first vegan bookmark. Then i bought veganomicon, choosing it from the reviews on amazon. It wasnt until then that i realized all of this was from the same kitchen. your recipes are always reliably fantastic. You have set a high bar for vegan recipes. Thank you for leading me through this journey. This looks delicious! Love the kale slaw! I made this tonight (with a few omissions and substitutions) and really enjoyed it. I didn’t bother with the beans… and I added grated carrots and thinly sliced red onion to the kale, and sprinkled toasted pumpkin seeds over the whole lot. I used red wine vinegar but would love to try it with lime, and maybe cilantro blended into the dressing, too. Overall, a really nice dish and an easy way to prepare tofu! Yummm…this looks so amazing. This kale slaw is going to be my next endeavor. Fantastic idea! Curry? Tacos? Kale? Slaw? These are some of my favorite things. Awesome recipe. swapped out the curry for chili powder, loved it! (could not help it, due to the presence of pinto beans, avocado & tortillas..predictable, but true) kale slaw was nice, but i think it would benefit from a little kick, & would drop a little hot sauce in the blender next time. yum yums all around! Had this for dinner tonight – 3 generations of my family scarfed it down. Sooooooo good! Taco fananatic, these sound amazing! Could not think of what to make for dinner. Pulled up PPK on the way to the store and decided to make the newest recipe on the blog. So glad I did! My omni chef (he wanted me to include that) husband and I LOVED these! Will definitely make again! Also the ingredients were just as good eaten bowl style sans tortillas. Loved these! 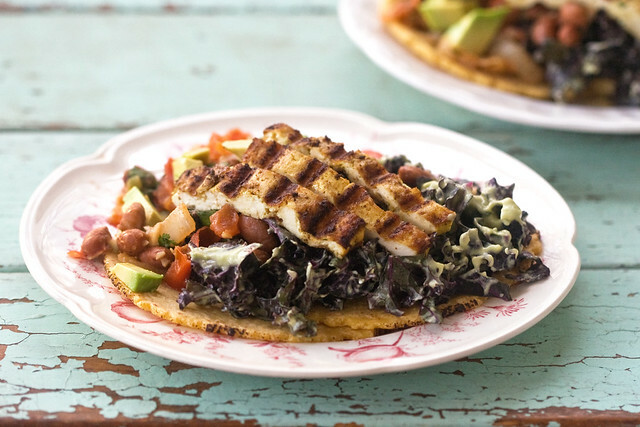 All of the separate components make these tacos very special. Thanks! This was pretty awesome. Great dressing on the kale slaw! With all the ingredients in my kitchen (minus red wine vinegar) it was my destiny to make this meal. Really enjoyed the process and the unusual blending of flavors. Loved the slaw dressing! If only I could say the same about kale…is that an acquired taste? The whole time I was thinking I will make that same slaw with good old-fashioned cabbage (red for the hippie in me too!) Anyone try it with a different green? Cuz that dressing rocks! Thank you PPK. This was one of the best vegan things I have ever cooked. Definitely use corn tortillas. I marinated the slabs of tofu in the curry dressing all day before grilling them, gave them a little more curry zip. 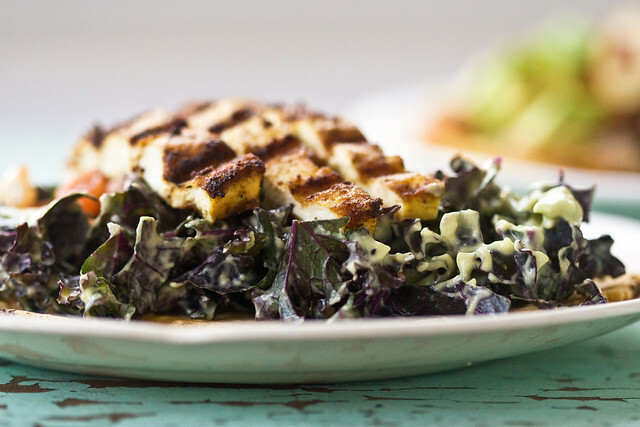 You had me at kale slaw – that sounds so great. Actually, you had me from the get-go really. It all looks amazing. That first sentence is gold. Now I have to make these tonight. This was a great meal. Thank you. These are SO delicious! I made them for dinner and had leftovers for lunch the next day, and dare I say it tasted even better second time around! This combination of flavors was amazing. Well worth the effort. Just ate 4 of them, and my tummy is HAPPY!!! Ok. I took the Vegan pledge and was looking for stuff to eat and I stumbled across this. I now have a new favorite way to enjoy kale. Thank You. Umm…amazing! I was in a funk and didn’t know what I was in the mood for, and this was perfect. I never would have combined all these foods myself, but they were so so so good! I used lime juice instead of red wine vinegar, since apparently I was out, but otherwise followed the recipe exactly. So many good nutrients wrapped up in deliciousness! I just finished eating this for a late lunch. Very tasty. The kale slaw needs a punch. Also I think it would be better to massage the kale with salt and olive oil before add the dressing. Next time I may try a chipotle dressing. I added Mexican seasoning to the pinto beans for extra flavor. I also added cilantro to the avocado dressing. Overall very tasty and I have a lot leftover for lunch tomorrow! Thanks Isa. This is one of those amazing dishes. I could never imagine how it tasted when I read it, but the flavors meld in a surprising way. You’re so innovative! Delicious. This was a fantastic meal!! I’ll be making this one often. I didn’t use tofu b/c, well, I forgot to buy it and it was still very filling and tasty. I also used a spelt wrap b/c I couldn’t find any organic corn tortillas. The dressing was so so good. I’m trying to think of all the other things I could use it on! This was amazing. I’ve been trying to eat entirely vegan the last month and this was by far the best dish out of the dozens I tried. Thanks! I just made this for dinner with a few of my friends! Super easy and fun to make together. This was absolutely delicious. Thank you so much! My 6 year old has just announced she is a vegetarian. PANIC! my partner and i are committed carnivores. I stumbled across this site and made this for dinner last night. WOW! we all loved it and have kept this recipe in my favourite folder. WHO KNEW?! Coming from Australia, I have never heard of you Isa, but am about to order your book. I feel like this is the beginning of a love affair with vegan food and am very excited! THANKS! Made this for dinner tonight and it was awesome!! Only I didn’t have any tortillas so I served it over brown rice and kinda mixed everything together. Was delicious. Thanks for the great recipe. Will make again for sure. Dude this website rules. Thank you for everything! Oh my goodness! This recipe ROCKS! My husband said it’s the best dish I’ve ever made. Thank you, thank you, thank you! I’ve been referring all my friends to this blog and your cookbooks. I don’t think I’ve ever made a “bad” meal when I use your recipes. You are AWESOME! Thanks for sharing your talent! 13 Surprisingly High-Protein Vegetarian Recipes | Make My friDay ! I made this for dinner last night and it was delicious. I didn’t use the tortillas, but otherwise followed the recipe. Thanks for sharing! I tried this recipe last week, I followed the ingredients but with different proportions based on what I had. This is my new go to dinner, SO easy, and restaurant quality! I’ve had horrible vegan food at several restaurants and this recipe was so much better than anything I’ve ever had. I can’t wait to try your other recipes! I’m hooked. Greetings from Ecuador. I love your recipes! I made these tacos when I was in USA, and i fell in love with them. Now back to my country I made them for my mom who isn’t vegan and she loved as well. You are awesome! Made this for friends last night – stuck exactly to the recipe – and everyone LOVED it! Each component is delicious on its own and perfect together in a taco. I would warn that you must love garlic…or cut a clove or two out of the beans. This was incredible! My husband and I are trying to eat more plant-based meals, but our three teen boys still protest for meat and rarely like the vegan/vegetarian dishes I make. But when I made this dish for my husband and oldest son tonight, they both gave a “two thumbs up” and a “really really good!” (husband adding that I need to make it every week … lol!) I only had bagged kale, so the slaw was more like a salad … and had to use white wine vinegar instead of red, so next time I’ll “fix” those two items and see if they still like it! I also couldn’t grill it … the tofu was too crumbly, so broiled instead. Thanks for sharing! Made these tonight and they were soooo yummy! I had to stop myself from eating the whole batch. I ended up having to sub a different dressing for the slaw because I didn’t have tahini but the components worked so well together anyway. 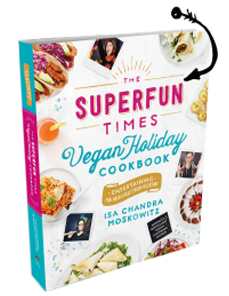 Even though I’m no longer vegan, you are still my go-to recipe author. Thanks for yet another home run! Tahini is not sold in or near my area, what could I use as a substitute? Nice recipe thanks for posting!